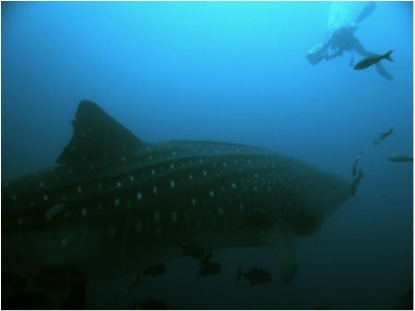 Many divers go a long way to the Galapagos to see whale and Galapagos sharks. Many visit Cocos to swim with hammerheads, or Socorro to play with giant mantas and enjoy the immense variety of Pacific fish. 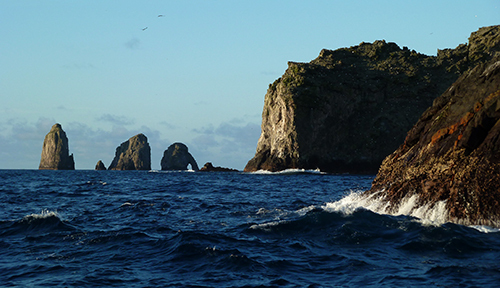 The small Colombian island of Malpelo has it all and still remains practically unknown among North American divers. 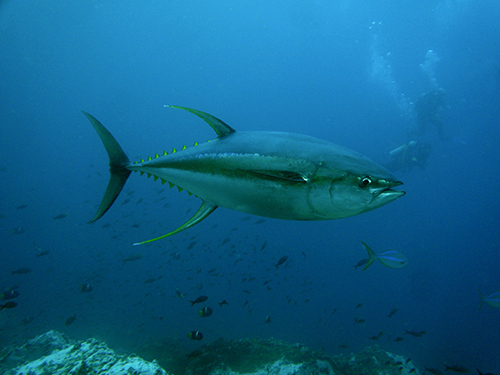 The Tropical Eastern Pacific is unsurpassed for interactions with big marine life. The west coast of both North & South America is washed by two grand oceanic currents: the California Current from the North and the mirroring Humboldt Current from the South, which makes the west coast a classic upwelling zone. Near the Equator, the collision of two gigantic streams is further mixed with another upwelling produced by the stable, low-pressure system of the Tropical Convergence Zone – the place where the ever-in-zenith sun heats the air, and easterly trade winds of the Northern and Southern hemispheres converge into high-towering clouds and thunderstorms. 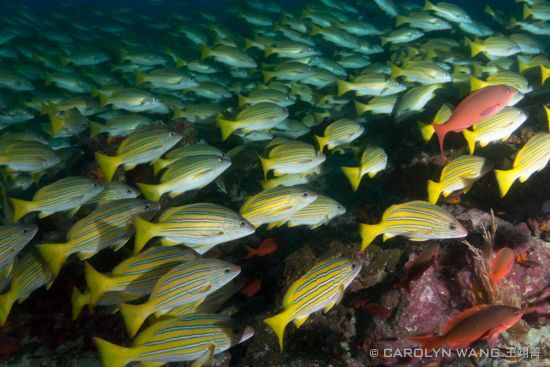 Strong ocean upwelling feeds a huge pyramid of marine life, and there is no better place on Earth to see the top of that mighty pyramid than the remote volcanic islands of the Tropical Eastern Pacific. 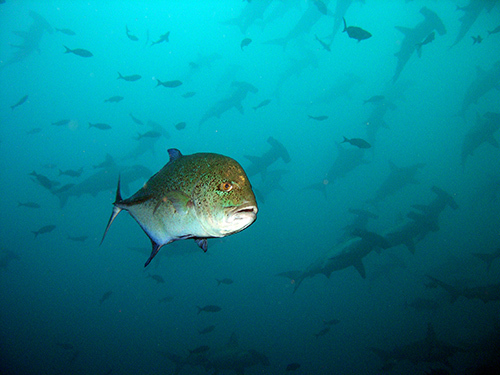 Malpelo island is unique to other islands in the Eastern Pacific. First of all, it is only eight square kilometers. Barren and nearly vertical cliffs of the island expose the summit of the three-hundred-kilometer-long volcanic ridge rising from the ocean floor at a depth of nearly 3 kilometers. With such a small island size and the entire ocean abyss encircling, the concentration of pelagic life in Malpelo waters is enormous. The spacious Galapagos and Socorro (Rivillagigedo) archipelagos pale in comparison. 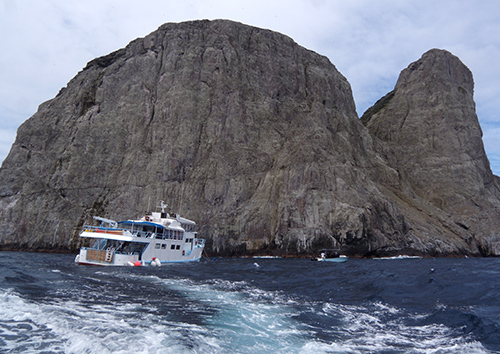 Even Cocos, solitary but still a larger island, does not have the geological advantage of Malpelo. At Cocos, divers have to visit deep-water pinnacles located well away from the main island to admire schooling hammerheads. 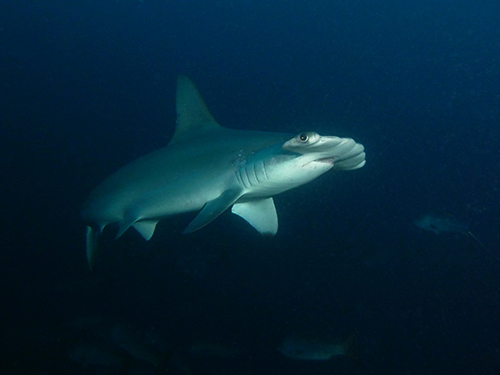 At Malpelo, sharks are abundant near the island itself and as a result, hammerheads are often encountered in very shallow waters. The advantage for a photographer is obvious – more chances to run into your model and more bottom time to take advantage of the opportunity. 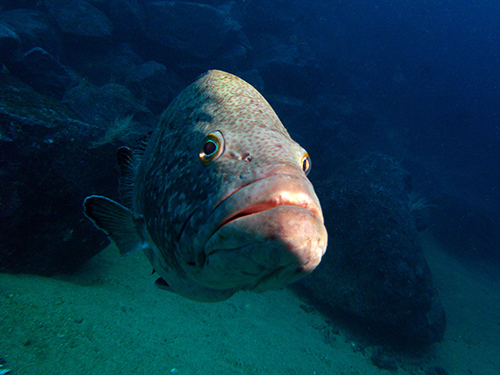 Another advantage for Malpelo divers is provided by the Colombian government, not nature. Access to Malpelo is very limited. As of writing this article, only five liveaboards are permitted to go to the island and only one boat with a max of 16 divers is allowed per day. The presence of small Colombian marine outpost and the very short wide open shoreline of the island help keep away the poachers. Unbelievable. Period. 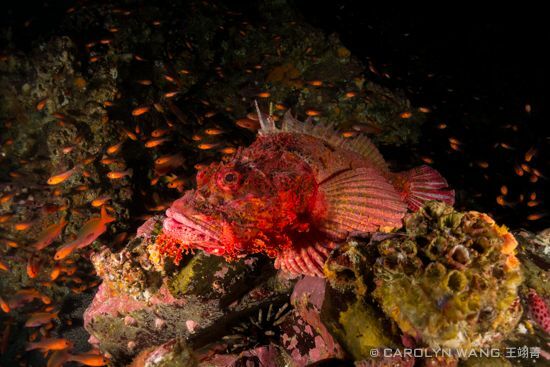 The best way to describe Malpelo is not through individual stories about individual dive sites, because Malpelo is one big dive site. You can encounter many animals pretty much anywhere around the island. We're talking about a genuinely wild place and truly wild animals. No sitings are guaranteed, but the chances of unique encounters are very, very good. I wouldn’t recommend Malpelo for novices. The diving isn't too challenging, but if your first trip is Malpelo, you will have serious problems finding your next destination. Most other places will look dull and boring. That is how I felt after Cocos and how I found Malpelo. You don’t need to be a really advanced diver to dive Malpelo, but nitrox is a must. Eastern Pacific diving without nitrox is just not a good use of hard-earned money. You also need to stay very conservative in Malpelo because the “nearest” decompression chamber does not exist - plain and simple. In open ocean diving your safety sausage should be big - about six feet. A smaller one might be obscured by the waves, and once deployed your next stop might be Australia. For Malpelo I prefer long stiff fins like the Cressi Gara - clumsy in the panga but indispensible in currents. 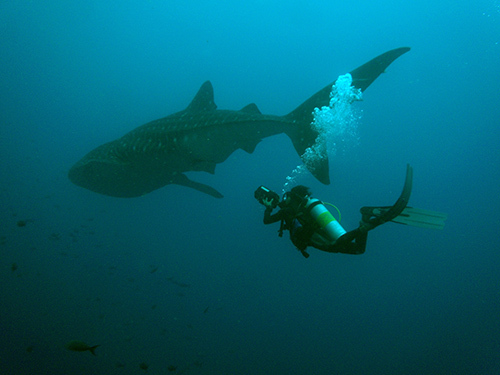 Whale sharks do not pose for photos so you'll need to exert a lot of effort swimming next to them. Since there is not much coral around, damaging the reef with long fins is not a huge concern, but divers should still be aware of sealife around them. When diving shallows near the wall, divers shouldn't brace themselves against the rocks. In high swells it is safer (and more fun) to move with the water. The same rule applies when taking photos in the grotto - do not grab the rocks. There are plenty of nasty eels in Malpelo. Free swimming morays are a trademark at Malpelo, and lots of fun to watch. 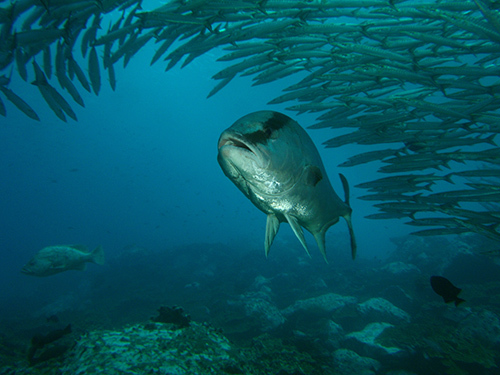 There are many different fish species in Malpelo, but don’t be entirely absorbed by the reef. 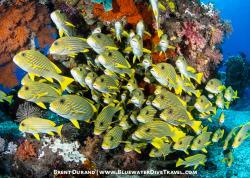 You can admire Pacific fish in other places on much cheaper dive trips. Look into the blue. The most interesting stuff swims in from the open water. Beware though - if you look for too long to the right, you are surely missing something on the left. Look for thermocline. Large sharks huddle there. If the shark is below you, never swim towards it as it will dodge deeper. Wait. Sharks circle around and will probably come back towards you. Whale sharks are an exception. Hammerheads fear strobe flash. If one comes toward you, remember that you have a single photo opportunity. Wait patiently for the best photo opportunity. If you don’t have an external strobe the best option is video. If you have a compact camera, get a wide-angle conversion lens. 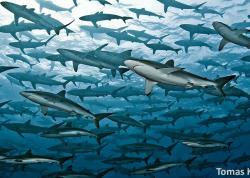 The cleaning station is the place to be when a school of hammerheads is nearby. Approaching the school will get you deeper and you will lose time and light. The school is best watched from the side, and at the cleaning station large singles will often swim within hand distance. Patience is key in order to get close to the sharks. Fish are your key to finding cleaning stations. Besides the regular barber-fish, there are two other cleaners in Malpelo, Clarion angel fish and juvenile rainbow wrasse. Get to know them. 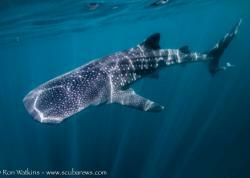 Black jacks often accompany whale sharks and seem to be hitting the shark sidewise, which is another form of cleaning. Big mantas here are not as abundant as in Socorro but they do show up. Watch for rocky outcrops in the current, since these create an upward water flow. 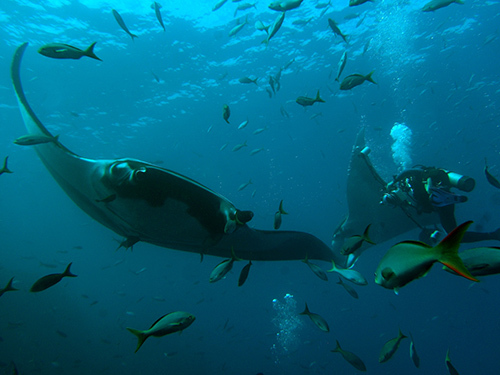 Mantas are heavy and love those upward currents. 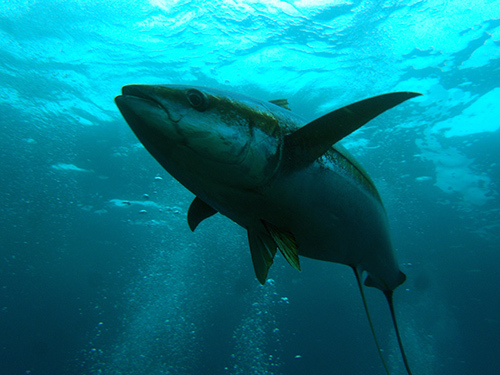 A common misconception is that bubbles scare away pelagic fish, but actually it's the direction of your movement that causes fish to flee. 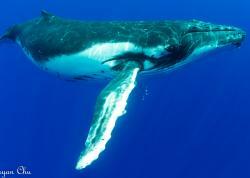 If there is large pelagic nearby, ascend slowly, moving away from the fish and it will come closer. This trick works as long as you avoid the eye contact. If the current is manageable, ask the DM to end the dive by ascending in open water. There might be interesting encounters with pelagics away from the island. 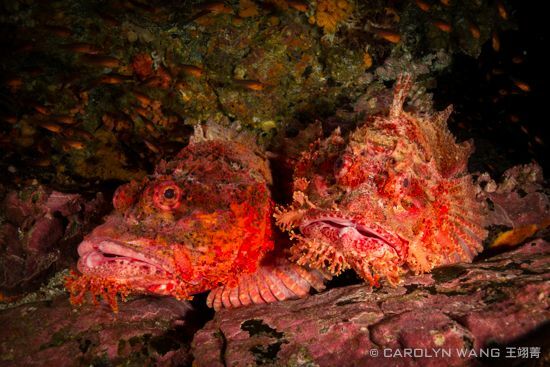 If you end the dive near the wall, pay attention to the foamy surge and you might be surprised with what you see. I have only one comment on photography in Malpelo: forget about macro. Be prepared for big stuff, non-stop action and fast-changing conditions. All pictures in this article have been taken with a compact camera, fixed 1/125s exposure and God's help. Even with simple settings I was able to capture only a meager fraction of what I saw. That said, the beauty of the animal encounters at Malpelo stays with you regardless of photo documentation. If at this point you are still reading this article, you should indeed consider visiting Malpelo. And if you have not safely stopped yourself, well, you are facing two major questions – how to get there and when to go. Due to limited access to the island, your options are few. First of all, no operators targeting North America go to Malpelo, and I believe this is the main reason for the lack of promotional information in the US. Secondly, out of five liveaboards operating at Malpelo, three come from Colombia. Unless you want to make your trip a true adventure, you would be better off staying with either of two German-owned Panamanian vessels: Yemaya or Inula. Both operators advertise primarily in Europe. Even in Russia, believe it or not, we have a web domain malpelo.ru. Check it out. At least out of curiosity... unless you read Russian. Out of two vessels, Yemaya is the boat of my choice. I'm sure Inula (a catamaran) is no less respectable and is a reliable operator, but MV Yemaya is just much larger and more comfortable, with a great upper deck to hang out on after the dives. Yemaya will pick you up directly from Panama City, while you would need another local flight to David when diving with Inula. 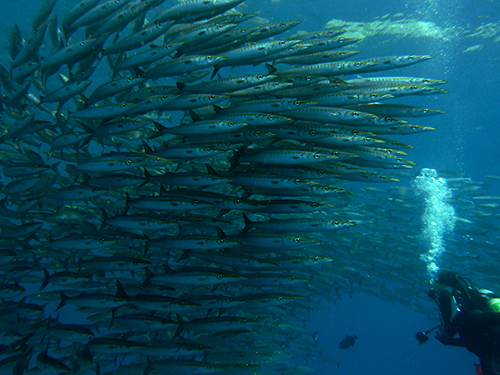 The Yemaya is run by Coiba Dive Expeditions. 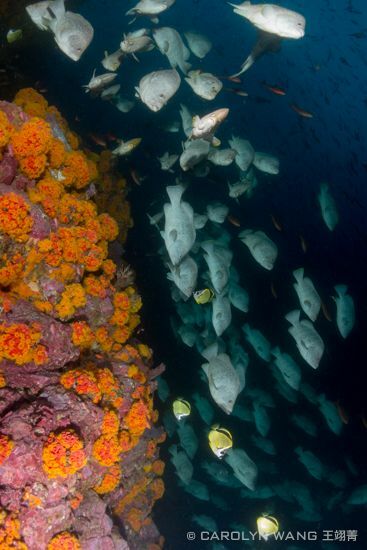 Coiba Island, by the way, is yet another perk and will be your first dive stop on the way to Malpelo. Truly, I’ve never had so much fun as I did diving Coiba, but that island needs its own article! Yet another valuable bonus with Coiba Dive Expeditions (which isn't promoted on their website) is that they pair up with an equally excellent tour operator who will gladly fill your arrival and departure days with Panama Canal or Old City tours. Both places are a real treasure-chest for photographers. In short: The winter is a sunny and windy dry season while summer is calm and rainy. Summer is generally considered the high season but there is no guarantee in the Eastern Pacific. Thermocline and visibility can change fast and dramatically. Even in high season you are better off with your luck than with the weather forecast. In detail: This might be a little tricky. Remember the Tropical Convergence Zone from the intro? The hot humid air rising from the ocean near Columbia will move to the north, drying and cooling down, and will finally descend on Southern California bringing us blue skies. Thank you, Panama. The same air mass will then head back to Panama in the form of Trade Winds, thus closing the circle. To understand the Panamanian seasons, imagine that during the winter time the Tropical Convergence Zone with its ever-in-zenith sun would naturally move south (remember, we are still in the Northern hemisphere) leaving the Panama and Colombia region exposed to dry Northern Trade winds. Drop in the collision of two main ocean currents and two types of upwelling and the result is relatively unpredicatable dive conditions. In conclusion, to answer the “when should I go” question I would say go as soon as you can afford it. Unlike Galapagos and Cocos, Malpelo is still well off the beaten path. How long will it stay that way? Will you see it before it changes? – I replied, "Yes, ever been?" Mikhail Kisin is a Russian physicist struggling to match his tightfisted vacation time to the generous travel opportunities of the New World. He writes for two Russian dive magazines. If your liveaboard is booked by Russians, blame him.